ContaCt us to see if your event qualifies for a grant. VisitMidland Sports & Entertainment | www.VisitMidland.com/Midland-Sports (800) 624-6435 | 303 W. Wall Street, Suite 200, Midland, Texas 79701 Photo Credit: City of Midland fields for every athlete. Play in Midland. 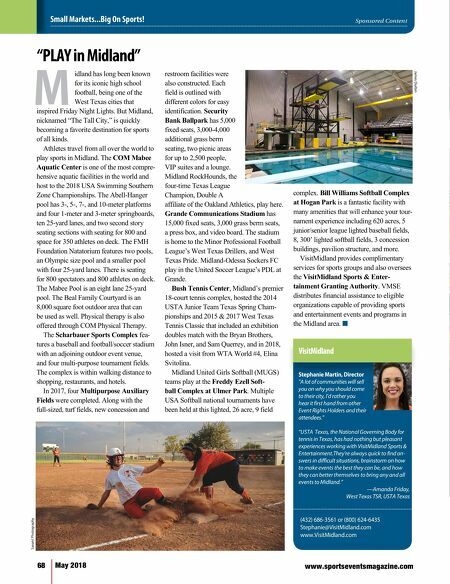 Credit: Stephen Tippett Credit: Stephen Tippett The Scharbauer Sports Complex features Security Bank Ballpark, Grande Communications Stadium, and four multipurpose auxiliary fields. The all-in-one complex is within walking distance to shopping, dining, and hotels. Security Bank Ballpark features 5,000 fixed seats, 3,000-4,000 additional grass berm seating, picnic areas, VIP suites, and a lounge. The ballpark is home to the Double A affiliate of the Oakland Athletics and four-peat Texas League Champions, the Midland Rockhounds. Grande Communications Stadium has 15,000 fixed seats, 3,000 grass berm seats, a press box, and video board. 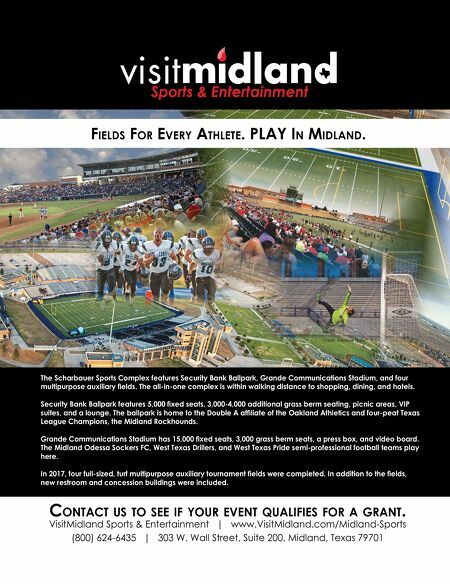 The Midland Odessa Sockers FC, West Texas Drillers, and West Texas Pride semi-professional football teams play here. In 2017, four full-sized, turf multipurpose auxiliary tournament fields were completed. In addition to the fields, new restroom and concession buildings were included.